The Seven Love Cures are Words Men Need to Know and Women Want to Hear. 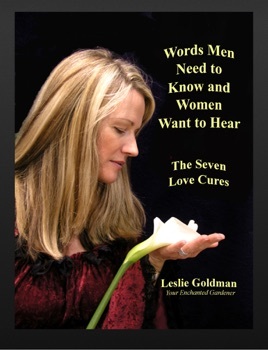 These are poetic deep, heartfelt words and wisdom teachings from Leslie Goldman, Your Enchanted Gardener, that have helped many individuals be secure in the loving relationships they have, and create breakthroughs of understanding in relationships. Originally sold on laminated plaques at $10.00 each, these poems have been called Alimony Insurance. Please read them out loud early in dating to get a sense of your match. Read them to create more love. These poems are Vitamin “L” for Love. They are priceless.